The striped skunk has very powerful legs and can dig and climb. They will destroy lawns by digging up the grass to get to insects and will nest under structures to breed. Mix and immediately begin bathing areas where smell is strongest. Follow immediately with tap water rinse and pet shampoo if desired. 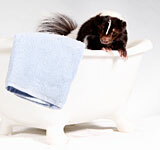 Dispose of any left over skunk deodorizer, do not try to store it can explode in a closed bottle! 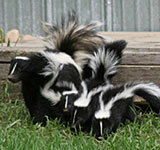 **One must presume there is a possibility of rabies with all skunks. Wear rubber gloves and wash thoroughly after rinsing off your pet. Protect/cover all open cuts on skin.